Yesterday, we braved the shopping crowds in order to take in a viewing of Frozen with the wee one (which by the way, was fantastic). Since we had already fought the good fight for a parking space in the busy Burbank shopping district, I could not help but pop into the Barnes & Noble where I figured I would find disappointment, but instead experienced pure elation. 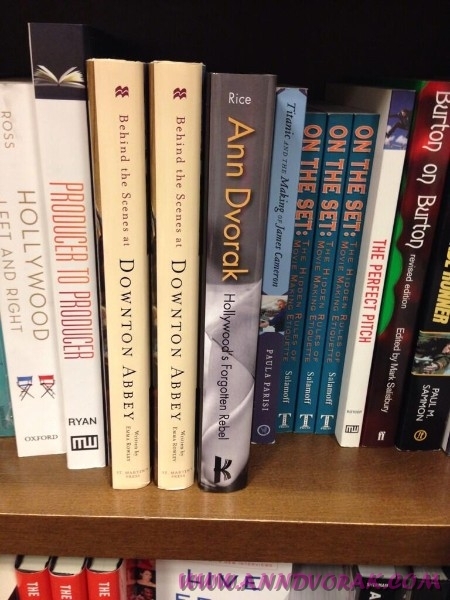 For there, the the Film & TV section, in between Behind the Scenes at Downton Abbey and Titanic & the Making of James Cameron, sat Ann Dvorak: Hollywood’s Forgotten Rebel. I did have my doubts that the book would find its way into a chain like B&N and seeing it there got me choked up a bit because it was something I have dreamed about for a very long time. Don’t ask about the shelving order, which is supposed to be by author but is not quite happening. Also, I am choosing to believe that there is only one copy on the shelf because the other 5 sold (I can continue to dream, can’t I?). I can only imagine how much of a thrill this has to be. Uh, let’s make it ten were stocked originally, and the other nine have been sold. I started reading yesterday, got more than half way thru. Will finish today. More than halfway thru yesterday? Wow, that is a huge compliment to me and Ann. Thanks! You should ask your publisher where your book is being sold. They should offer that information to you. I work in the business, and have worked for B&N in the past, and they’ve always been really good about stocking biographies of classic Hollywood stars. I usually rely on them for browsing new biographies. Their biography section is always very robust. I just started your book and am loving it already! Thanks for the info Raquel! I was going to be speaking with my publisher today anyways and will follow up with your suggestions.